Hotline Bling Remix – Monique from Monique MoMo Gonzalez on Vimeo. 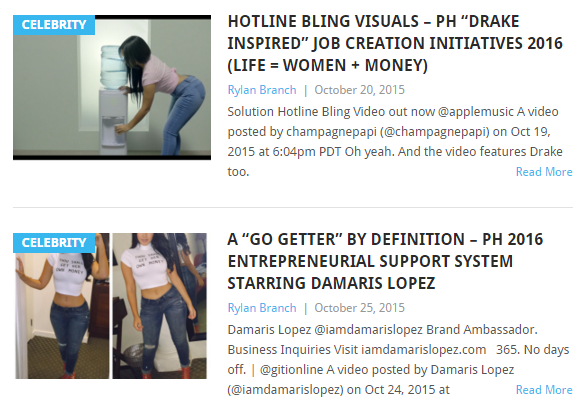 Click on the images above to review the Hotline Bling articles. Authentically speaking… Drake would probably find it more rewarding to have these young women demonstrating the effectiveness of the conversation than Donald Trump on an SNL spoof in the name of ratings, but regardless, if they ( business women) wanna work and are serious about success, profitability, and progress, then PimpHop.com will just continue create and facilitate more wonderful opportunities for them to work by acting on the following steps listed below. A “1-800-Pim-pHop” perspective to consider. BANGERZ – Miley Cyrus “Goin’ 80’s” On The Game With Her New Album Cover! Telepathy – Fact Or Fiction?